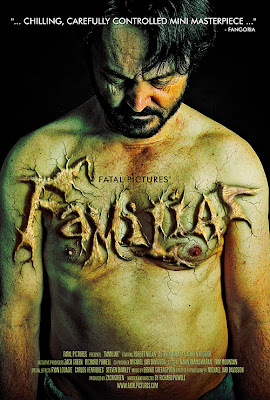 Here is a preview of director Richard Powell's upcoming horror short "Familiar." This latest film comes from Canadian production company Fatal Pictures, which recently completely another horror short, titled "Worm." Both "Familiar" and "Worm" have been acted in by Robert Nolan. Nolan plays the central protagonist in "Familiar" and this is a tale of a middle aged man who is hearing strange voices! Have a look at the first official poster art, which shows: green flesh and scarring. There is no word on when this title will release; however, Fangoria has hosted an expose on this film in issue #305. More details on "Familiar" Read full article here.